Pursuit Magazine Overhauls Information Network With Launch of PursuitWire.com. January 5, 2012, Pensacola, FL – Pursuit Magazine launched the innovative newswire site, http://pursuitwire.com, on January 1, 2012 in an effort to educate and improve the success rates of members of the private investigation, security and bail enforcement industries. PursuitWire delivers important and breaking new stories that are directly related to private investigators, security, fraud, technology, forensics, hacking, crime, fugitives, bail, repossession and pertinent industry-related business issues. PursuitWire disseminates timely news articles that have been collected from newswires and international media outlets via its website http://pursuitwire.com and through the associated Twitter account located at https://twitter.com/pursuitmag. There are also several different RSS feeds available for PursuitWire, enabling subscribers to specifically tailor the type of information they wish to receive. 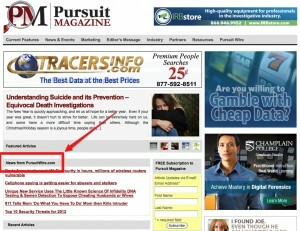 Additionally, subscribers can monitor the PursuitWire feed through a self-updating ticker on the Pursuit Magazine homepage at http://pursuitmag.com. CompassPoint Investigations is a private investigation agency primarily providing insurance fraud investigation and service of process services, headquartered in Pensacola, Florida and serving the Gulf South area between Mobile, AL and Destin, FL. In addition to the Pursuit Magazine network of websites, other subsidiaries of CompassPoint Investigations include PIeducation.com, the market leader in state-required continuing education for private investigators, as well as several other highly regarded online training websites. L. Scott Harrell is the managing principal of CompassPoint Investigations, a thriving private investigation agency based in Pensacola, Florida, as well as the digital marketing and competitive intelligence consultancy, Broadside Incorporated.